After years of impatient hand-wringing and gritted teeth, it’s finally here: A brand new Darkwing Duck comic series! Words cannot describe how excited I am to see my absolute favourite superhero back in action after what has felt like an eternity of waiting (okay, it was actually six years, but that is basically an eternity). 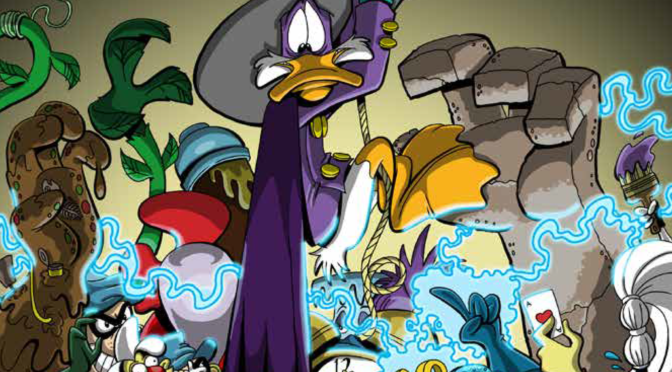 For those unaware, the new Darkwing Duck series picks up after the events of the Definitely Dangerous Edition. Thorough reading of the previous series is not necessary to understand the present plot, although it certainly adds another layer of entertainment to the story. The first storyline, Orange is the New Purple, spans three action-packed issues filled to the brim with cameos and Easter Eggs, brought to us by none other than artist James Silvani. The new Darkwing team doesn’t hold back any punches. From the very first page, the series hits the ground running – literally—with a high-speed parade float chase that segues into the first story arc of Darkwing Duck’s newest adventure. There have been a lot of changes in St. Canard since the titular cartoon series, including a brand new state-of-the-art supervillain prison. 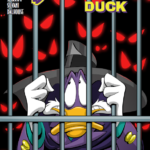 Our story begins here, when an inevitable jailbreak leaves Darkwing trapped inside with nearly all of his known foes, cartoon and comic characters alike, including some brand new faces created by writer Aaron Sparrow. It’s up to the masked mallard to fend off an army of super-powered fiends using his typical array of gadgetry and arrant alliteration (with a little help from a certain spirited daughter of his). Without spoiling too much, I will say that Orange is the New Purple never fails to deliver on entertaining dialogue, diabolical plots, and villainous team-ups you never knew you wanted until you see them in action. It’s clear that Aaron Sparrow has a solid grasp of the characters, and does an excellent job at integrating them into a modern-day St. Canard where change doesn’t have to be a bad thing. Darkwing himself has updated his wardrobe by discarding his turtleneck for a more sophisticated tie and adds a second gas gun to his arsenal – a redesign by creator Tad Stones. But one thing remains constant, and that is DW’s sarcastic, witty banter which only gets better throughout the plot’s progression. What I find most impressive about this entire arc is that a ridiculously large number of villains are crammed into each issue, and yet the storyline never feels rushed or laden with unnecessary prose. A balance has been struck by making each character feel pertinent to the storyline. Aaron Sparrow did an excellent job of selecting villainous partnerships that were complementary to one another – every interaction flows naturally and is filled with the type of silly jokes one might expect from a comic about talking cartoon ducks. I am also enjoying the colours by Andrew Dalhouse – they add a real ‘oomph’ to James Silvani’s artwork – especially the scene where the “Big Bad” looms over our masked hero as a threatening silhouette. Personally, Issue 3 was my absolute favourite for a number of reasons: Our Big Bad of the story is shown in his element, and I absolutely love the stretchy, expressive faces this character makes. Not to mention there are a number of Frozen references that had me laughing out loud. One of my favourite new additions to this comic series actually comes after the end of each issue. Aaron Sparrow shares with us bonus material such as storyboards from the cartoon, and interesting tidbits of trivia about the creation and development of the series. Issues 2 and 3 also contain short one-page biographies for a number of villains appearing within the comic, straight from Darkwing Duck’s “secret files”. This plethora of information is excellent for readers who are unfamiliar with the cartoon or simply want to learn some extra facts about their favourite baddies. Everything about this series is top-notch. I get a sense that there is a combined effort happening behind the scenes by a harmonized team to bring us the type of story we’ve always wanted. Between the writing, the artwork, the colours, the lettering, and the editing, this new Darkwing Duck comic will not fail to disappoint fans. Hats off to Team Darkwing for all of their hard work! Full disclosure: I am among the names listed in the “thank you” credits on the first page of the Definitively Dangerous Edition. This is due to my participation with signal-boosting the comics, and occasionally offering feedback to the writer. That said, I had no involvement in the writing, dialogue, or specific changes that were made to the newly re-written omnibus. 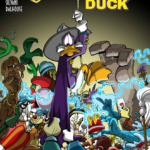 Not included is the DuckTales/Darkwing Duck crossover entitled “Dangerous Currency”, which originally spanned Issues 17/18 of Darkwing Duck, and Issues 5/6 of DuckTales. Current writer/editor Aaron Sparrow has indicated that a new crossover is planned for the future. While the initial plot for each story remains the same, Definitely Dangerous contains extensive revisions to the dialogue, as well as a few artwork updates and brand new pages. There’s a lot to talk about, but I’ll try to narrow it down to some of the biggest changes I noticed. To be more specific, the single swear word originally appearing in Issue 3 of the “Duck Knight Returns” arc, in which Megavolt uses the word “crappy”. While this is a seemingly innocuous change, it in fact shifts the entire dynamic of the comic from “adult fans” to “all ages”. Disney is, after all, known for their family friendly reputation. A litany of alliteration! In the cartoon, Darkwing was well-known for his copious usage of alliteration, particularly during his long-winded heroic speeches. This omnibus is chock-full of new lines, to the point where the characters even crack a few meta comments about it. I have to wonder if Aaron Sparrow was eating and sleeping with a thesaurus glued to his hand at all times. There were a few words in there even I had to look up. In a recent interview, James Silvani explained he had little reference material to work with for the earlier issues. Definitively Dangerous was his opportunity to fix up the art and make the characters more ‘on model’ with the cartoon. Other panels have been completely replaced, such as Cat-Tankerous’ backstory, and additional panels included when Darkwing confronts the hypnotic villain Suff-rage. Definitively Dangerous is jam-packed with brand new jokes, and in some cases completely alters the tone of the comics from “serious” to “making fun of seriousness”. This shift is most evident in the “F.O.W.L Disposition“ arc, which has probably received the most revisions compared to the other arcs. Just about every piece of dialogue has been altered in some shape or form. Steelbeak’s signature accent becomes more overt as he playfully banters with Darkwing throughout all four issues. The original comic contained a number of scenes comprised of foreshadowing and subtle characterization. The “Crisis on Infinite Darkwings” arc was well known for a few ominous pieces of dialogue that have now been altered to reflect future events. That said, the overarching plot for the series remains largely intact, and select pieces of foreshadowing were left untouched — perhaps in preparation for the new series. Whether the Definitively Dangerous Edition is an overall improvement to the original series is an opinion that will vary from reader-to-reader. Some fans may prefer the original version, while others may enjoy the changes brought to us by a new creative team. Value-wise, if you’re indifferent to the alterations and would like all of the comics (sans crossover) collected in one volume, this omnibus is an excellent deal considering the price tag does not stray above $30 (before shipping). You can find a list of online retailers here that are currently selling Definitively Dangerous in the U.S and world-wide. And of course, don’t forget that a new ongoing comic series is currently in production! Stay tuned for future updates as we hear more about what’s next for our daring duck of mystery later in the year. After a rather grim and muddled conclusion to F.O.W.L Intentions, I wasn’t quite sure what to expect from the next arc. Launchpad and Darkwing running against each other for mayor? A handful of new baddies? Where exactly is the story taking us? When all was said and done however, Issues 13 through 16, “Campaign Carnage”, were a significant improvement. The pacing in particular was spectacular and it was something the F.O.W.L story severely lacked. The plot devices of this arc were unfolded slowly, with plenty of time for action-packed battles and humorous shenanigans. The story was not jammed with unnecessary characters or overwhelmed by philosophical exposition. A few of the gags fell flat and there were some inconsistencies in the storyline, but these were balanced out by James Silvani’s captivating imagery. Although Issues 13-16 are all connected to the same plot, each comic contained an individual story featuring a different villain. And for the first time since Tad Stones’ Chronoduck, we finally get a chance to add a few more sinister supervillains to Darkwing’s ever-expanding rogue gallery. Issue 13 “Done in One” continues off where the FOWL arc left us, with Darkwing searching for his missing girlfriend Morgana. Meanwhile, a former baseball star gone nutso has taken on the villainous identity of One-Shot. If you can’t figure it out from his name, his unique ability is that he can only throw the same item once– a gag which certainly must have kept artist James Silvani quite busy. Just for fun, I challenge everyone to go through the comic and count how many different items the obsessive-compulsive simian uses as a deadly projectile. The events of this issue are the precursor to the election, which is not introduced until the very end. Darkwing’s reasoning for running as mayor was rather dodgy, but this wouldn’t be the first time the Terror that Flaps has gone overboard with a ridiculous idea. Issue 14 “Cat-Tastrophe” jumps straight into the election, with Darkwing attempting to convince the citizens of St. Canard that he’s a surefire choice for running the city. Meanwhile, yet another villain is on the rampage: Cat-Tankerous. Former editor Aaron Sparrow coined the clever title for this deadly pussycat, while artist James Silvani fleshed out the background details and story. Without spoiling it, I’ll say that the flashback to his ‘how I became a villain’ story left me grinning. Very adorable and unexpected! At the same time we are introduced to Constance A. Dention, a female candidate running against Darkwing for mayor. A female villain who resembles Spiderman’s Mysterio also makes a brief appearance. Slowly, the plot begins to tie itself together, revealing that a larger force is behind the villainous rampages. Issue 15 “The Ballot of Darkwing Duck & Launchpad” brings us to the height of the election, with Launchpad now entering as a third candidate. More and more new supervillains are showing up; Darkwing has his hands tied with protecting the city and keeping up with his campaign.You’ll find a lot of eye-candy in this issue: Spreads containing old and new villains alike, as well as some amusing cameos. We are also introduced to the previously unnamed female villainness, Suff-rage and The League of Barely-Remembered Supervillains (my favorite part, and also coined by James Silvani). Issue 16 brings the election to a close with some surprising reveals. We find out who becomes the new mayor as well as the identity behind the strangely-familiar Suff-rage. 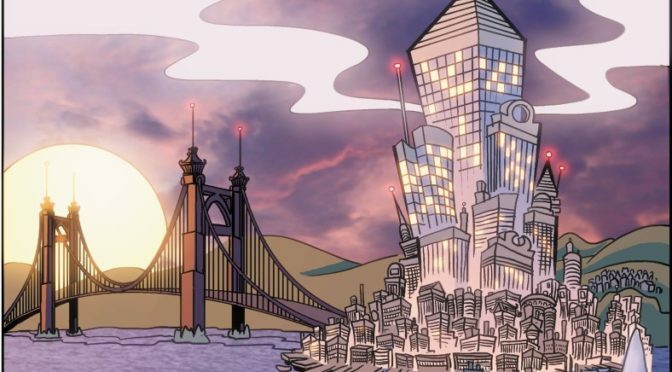 The conclusion also kick-starts the beginning of next month’s DuckTales and Darkwing Duck crossover, featuring a familiar face from the Mickey Mouse comic books. Campaign Carnage was definitely a nice break from the epic world-threatening chaos dealt out in both the Crisis and F.O.W.L stories. It was a fun read, and even more fun to look at — James Silvani made sure to include plenty of his Disney Easter eggs. Next month we prepare a farewell as the BOOM! 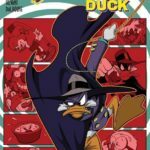 Darkwing series comes to an end with a double-dose of the ducks, starting with Darkwing Duck #17 and Duck Tales #5 and then finally Darkwing Duck #18 and DuckTales #6 in November. New Darkwing comic series officially announced for April! New Darkwing comics happening this year? We think so! Disclaimer: This blog is in no way affiliated with Disney, BOOM! Studios, Joe Books, or any other major publisher/corporation. This site is run by fans, for fans.